Emmanuel MacronPresident of France Édouard PhilippePrime Minister of France Christophe CastanerMinister of Interior Richard LizureyHead of the National Gendarmerie The yellow vests movement or yellow jackets movement (French: Mouvement des gilets jaunes, pronounced ) is a populist, grassroots political movement for economic justice that began in France in November 2018. After an online petition posted in May had attracted nearly a million signatures, mass demonstrations began on 17 November. The movement is motivated by rising fuel prices, high cost of living, and claims that a disproportionate burden of the government's tax reforms were falling on the working and middle classes, especially in rural and peri-urban areas. The protesters have called for lower fuel taxes, reintroduction of the solidarity tax on wealth, a minimum wage increase, the implementation of Citizens' initiative referendums and Emmanuel Macron's resignation as President of France and his government. The movement spans the political spectrum. According to one poll, few of those protesting had voted for Macron in the 2017 French presidential election, and many had either not voted, or had voted for far-right or far-left candidates. The yellow vests movement or yellow jackets movement (French: Mouvement des gilets jaunes, pronounced [muvmɑ̃ de ʒilɛ ʒon]) is a populist, grassroots political movement for economic justice that began in France in November 2018. After an online petition posted in May had attracted nearly a million signatures, mass demonstrations began on 17 November. The movement is motivated by rising fuel prices, high cost of living, and claims that a disproportionate burden of the government's tax reforms were falling on the working and middle classes, especially in rural and peri-urban areas. The protesters have called for lower fuel taxes, reintroduction of the solidarity tax on wealth, a minimum wage increase, the implementation of Citizens' initiative referendums and Emmanuel Macron's resignation as President of France and his government. The movement spans the political spectrum. According to one poll, few of those protesting had voted for Macron in the 2017 French presidential election, and many had either not voted, or had voted for far-right or far-left candidates. Rising fuel prices initially sparked the demonstrations, and yellow high-visibility vests, which French law required all drivers to have in their vehicles and to wear during emergencies, were chosen as "a unifying thread and call to arms" because of their convenience, visibility, ubiquity, and association with working-class industries. The protests have involved demonstrations and the blocking of roads and fuel depots. Some of the protests developed into major riots, described as the most violent since those of May 1968 and the police response, resulting in multiple incidences of loss of limb has been criticised by international media. Since the French yellow vests or Gilets jaunes movement has gained international attention, protesters—some with similar grievances and others entirely unrelated—have used the yellow vest symbol in many places around the world. Late in June 2017, Macron's Minister of Justice, François Bayrou, had come under pressure to resign, due to the ongoing investigation into the financial arrangements of the political party (MoDem) he presides. During a radio interview in August 2018, Nicolas Hulot had resigned from the Ministry of the Environment, without telling either the President or the Prime Minister of his plans to do so. Criticized for his role in the Benalla affair, Gérard Collomb tried to resign in October 2018 as Minister of the Interior—leaving himself with only two jobs, i.e. senator and mayor of Lyon—but saw his resignation initially refused, then finally accepted. In the 1950s, diesel engines were used only in heavy equipment so, to help the post-war productive effort, the French government granted lower taxes. The 1979 oil crisis prompted efforts to curb petrol (gasoline) use, while taking advantage of diesel fuel availability and diesel engine efficiency. The French manufacturer Peugeot has been at the forefront of diesel technology, and from the 1980s, the French government favoured this technology. A reduction in VAT taxes for corporate fleets also increased the prevalence of diesel cars in France. The protesters criticise Édouard Philippe's second government for making individuals liable for the bulk of the cost of the carbon tax. As the carbon tax has progressively been ramping up to meet ecological objectives, many who have chosen fossil fuel-based heating for their homes, outside of city centres—where a car is required—are displeased. President Macron attempted to dispel these concerns in early November by offering special subsidies and incentives. The government's decision last year to cut the speed limit on country roads from 1 July 2018 from 90 to 80km/h, despite opposition, was a factor in the rise of the movement, being seen as a failure to understand the needs of rural residents who are totally reliant on their cars. The vandalisation of traffic enforcement cameras grew significantly after the yellow vest movement began. Éric Drouet and a businesswoman named Priscillia Ludosky from the Seine-et-Marne department started a petition on the change.org website in May 2018 that had reached 300,000 signatures by mid-October and close to a million a month later. Parallel to this petition, two men from the same Departement launched a Facebook event for 17 November to "block all roads" and thus protest against an increase in fuel prices they considered excessive, stating that this increase was the result of the tax increase. One of the viral videos around this group launched the idea of using yellow jackets. One of the goals of the Yellow Jackets is to obtain the right to direct initiative, in other words the right to petition the government at any time to propose or repeal a law, to amend the constitution or remove a public official from office. The bottom-up Swiss model of government, where referendums are frequent, has been compared to the top-down French governmental system to explain the lack of a similar movement in French-speaking Switzerland. Étienne Chouard, and a retired dentist named Yvan Bachaud, who named the RIC, were among the earliest proponents of such referenda. More recently, several politicians included the idea in their 2017 presidential platforms. A protest on 17 November cutting the road near Belfort. "Motorists, citizens: we are being lied to, swindled, dispossessed, and scorned; but now the scorned are in the streets, and the scornful will be removed from power!" In addition to roads, protesters also blocked as many as ten fuel depots. On this first day of protests, a 63-year-old pensioner was run over by a motorist in Le Pont-de-Beauvoisin while she was demonstrating at a roundabout at the entrance to a commercial zone. A motorcyclist died after being struck the same day by a van trying to get around a barricade. By 21 November 585 civilians had been injured, sixteen severely, and 115 police officers, three seriously. Protests also occurred in the French overseas region of Réunion, where the situation deteriorated into looting and riots. Schools on the island were closed for three days after protesters blocked access to roads. On 21 November, President Macron ordered the deployment of troops to the island to calm the violence. With the protests in Paris having raised tensions the previous week, the Interior Ministry agreed to allow a gathering on 24 November at the Champ de Mars. The protests attracted 106,000 people all across France, only 8,000 of whom were in Paris, where the protests turned violent. Protesters lit fires in the streets, tore down signs, built barricades and pulled up cobblestones. Police resorted to tear gas and water cannons to disperse the protesters. On 26 November, an official estimated that the riots in Paris during the two previous days had cost up to €1.5m in damage. Two hundred additional workers were assigned to assist with the cleanup and repair work. A protest called "Act 3 – Macron Quits" was organised for 1 December. Yellow jackets briefly occupied the runway at Nantes Atlantique Airport and prevented access to Nice Côte d'Azur Airport. Vinci Autoroutes reported tollbooths were blocked on 20 major arteries all across France. In Marseille, where demonstrations have been frequent since the 5 November collapse of a building and the evacuation of the surrounding neighbourhood, an 80-year-old Algerian woman trying to close her shutters was hit by shards from a police tear gas canister, later dying while in surgery. A second motorist was killed on the third weekend after crashing his van into stopped lorries at a barricade on the Arles bypass. More than 100 cars were burned in Paris during the protest on 1 December, and the Arc de Triomphe was vandalised. On the following Monday, Paris Mayor Anne Hidalgo estimated the property damages at €3–4 million. Protests turned violent for the second week in a row in Le Puy-en-Velay. Civil unrest marred the Festival of Lights in both Lyon and Saint-Étienne. The A6 motorway was again blocked north of Lyon in Villefranche-sur-Saône. In Bordeaux, after two hours of skirmishes between the police and protesters, rioters took advantage of the situation to set fires and pillage the local Apple Store. Paris experienced protests for the fourth consecutive week. Many shops were boarded up in anticipation of violence, with The Louvre, Eiffel Tower and the Paris Opera also closed. Police assembled steel fences around the Élysée Palace and deployed armoured vehicles on the streets in an attempt to limit the violence. In his 10 December speech to the French people in response to the movement, Macron pledged a €100 per month increase in the minimum wage in 2019, the exclusion of charges and taxes on overtime hours in 2019, and on any 2018 end-of-year bonuses paid to employees. Macron likewise announced that pensioners on low incomes would be excluded from an increase in the CSG in 2019. He stood by his replacement of the solidarity tax on wealth with increases in property taxes. The broadcast was watched by more than 23 million people, making it the most-viewed political speech in French history. After investigation, it became apparent that the minimum wage itself would not be raised by €100 a month but that those eligible would see an increase in the activity bonus paid by the CAF. On 11 December, after having declared a state of economic and social emergency the day before, Macron invited representatives of the French banks to the Elysée to announce that the banks had agreed to freeze their prices in 2019 and to permanently limit incident-related fees to €25 a month for people in extreme financial difficulty, as determined by the Bank of France. In the wake of the 2018 Strasbourg attack, the government asked protesters to stay off the streets. According to the Paris prefecture estimates, there were 8,000 police for 2,200 demonstrators in Paris. The Minister of the Interior estimated that 66,000 people protested in France on 15 December. Conflict arose in Bordeaux, Toulouse, Marseille, Lyon and Paris. At the end of the day, the Interior Minister called for the roundabouts, occupied since 17 November, to be liberated. Demonstrations continued throughout the country. The Ministry of the Interior announced a participation figure almost half that of the previous week with 38,600 demonstrators throughout France, including 2,000 in Paris according to the Prefecture of Police. Versailles Palace was preventively closed for the day. Éric Drouet, the 33-year-old truck driver who is one of the most followed yellow jackets on Facebook, was arrested for organising an undeclared demonstration and participating in a violent assembly. He had called on Facebook for demonstrators to meet at Versailles but then revised the call to Montmartre after it had been announced that Versailles would be closed. Authorities say that Drouet was carrying a truncheon and would be summoned in court where they would seek to prevent him from coming to Paris. Protesters blocked border traffic to Switzerland at Cluse-et-Mijoux. They were dispersed after one hour by police. Similar operations were conducted at the Spanish, Italian, German, and Belgian borders. Two distribution platforms were blocked in Montélimar: EasyDis (Groupe Casino) and Amazon. Overall, at least 220 people were arrested in the country, including 142 in Paris. A motorist was killed on 21 December when his car hit a truck that was stopped at a blockade in Perpignan, the tenth fatality overall. Much quieter than in the first weeks on a national level, there was a significant confrontation in Rouen, Normandy, after fires were set in front of the local branch of the Banque de France. In Paris, the protesters demonstrated in front of the headquarters of BFM-TV, Libération and France Télévisions. Victor Glad suggests that the same crisis of representation motivating the citizens' initiative referenda is also behind the gilets jaunes' criticism of the traditional media. According to French Ministry of the Interior, the first demonstrations of 2019 brought 50,000 people into the streets across France. A door to Rennes' city hall was damaged, while government Spokesman Benjamin Griveaux was evacuated from his office on Rue de Grenelle (Paris) through the garden, after rioters hijacked a forklift to break down the door to the Ministry. There were also skirmishes in Bordeaux, Nantes, Caen & Rennes. Women's role, both in defining the movement's objectives and in communicating at roundabouts, is—for editorialist Pierre Rimbert—a reflection of the fact that women make up the majority of workers in "intermediary professions" but are three times more likely to be classed as "employees" than men according to an INSEE study in 2017. In the eighth week, women organized separate demonstrations in Paris, Toulouse and Caen. According to one of the organizers, the goal was to have a "channel of communication other than violence". The interior minister announced that over 60% of the traffic enforcement cameras in the country had been vandalised. This was up from estimates of 50% in early December. Attendance increased in the ninth straight weekend of protests, with at least 84,000 demonstrating on 12 January for economic reform across France, including 8,000 in Paris, 6,000 in Bourges, 6,000 in Bordeaux, and 2,000 in Strasbourg. Government officials deployed 80,000 security forces nationwide, vowing "zero tolerance" for violence. The CRS (riot police) resorted to tear gas in most major cities. On the streets of Paris, protesters marching "noisily but mostly peacefully", singing the French national anthem, were met by 5,000 riot police officers, armored vehicles and barricades. Citing the 5 January attack on the Dijon gendarmerie and terror threats, the police communication service said that some CRS agents were authorized to carry semi-automatic weapons. This was confirmed by the Paris prefecture. Small groups of people left the designated protest route and threw projectiles at police. Around the Arc de Triomphe, riot police fired water cannon and tear gas at protesters after being hit with stones and paint. 244 people were arrested nationwide; 156 in Paris. A "massive" gas explosion caused by an apparent gas leak in a bakery in northern Paris killed four people, including two firefighters already at the scene investigating the leak, and injured dozens more. The explosions occurred early on 12 January, while Paris was under heavy guard in anticipation of the day's demonstrations. The French Interior Minister told the media that "responsibility triumphed over the temptation of confrontation" and that protesters marched in Paris "without serious incident". As in week IX, police estimated that 84,000 people demonstrated across France, including a peak of 10,000 in Toulouse for a short period, 7,000 in Paris (where protesters demonstrated on the Left Bank for the first time), 4,000 in Bordeaux, and 2,500 in both Marseille and Angers. This weekly protest is the first to happen after the launch of the "Great National Debate" by President Emmanuel Macron. Nationwide demonstrations continued for an eleventh straight week on Saturday, 26 January. The French interior ministry estimated crowds of 69,000 across the country, and local police estimated 4,000 in Paris. A high-profile member of the protest movement, Jérôme Rodrigues, was maimed after being shot in the face by police with a flash-ball launcher, resulting in the loss of his right eye. Dozens of people have been similarly injured during the course of the yellow vests protests. "I was deliberately targeted. I am a figure of the movement, at least in the Paris protests, and police pointed their fingers at me many times during previous demonstrations, so I think they knew very well who they were shooting at," Rodrigues told the media. The following day, an estimated 10,000 people marched in Paris in a foulards rouges ("red scarves") counter-protest in opposition to the yellow vests. On Friday, 1 February 2019, Edouard Philippe went to Bordeaux and informed merchants that an agreement had been found with insurers to treat insurance damage claims in successive weeks as part of a single event (with a single deductible). He also announced that the ten cities most affected by degradations, including Bordeaux, would receive €300,000. In Valence, the downtown shopping district was boarded up, trash cans, park benches and protective fencing were removed. Paving stones had been tarred over to eliminate the risk of their being used as projectiles. According to the préfecture, 1850 people demonstrated in downtown Tours, which had likewise been boarded up. On Saturday, 2 February, between 10,000 and 13,800 people protested in Paris, with thousands more in Tours, Valence, Marseille, Bordeaux, Toulouse, and other French cities. The demonstrations of "Act XII" focused on denouncing the number of serious injuries caused by police violence during anti-government demonstrations. According to the French government, around 2,000 civilians were injured in protests between November 2018 and February 2019, including four serious eye injuries. The government agency that investigates police abuses has opened 116 investigations into police conduct during the protests, ten of which concern serious eye injuries suffered by protesters. A group of 59 lawyers published an open letter denouncing the treatment of protesters in the courts, including rushed judgments against protesters without regard for their rights, which they contrasted with the slow pace of investigations into reports of police violence. Earlier in the week, France's highest court denied a request to ban police from using "flash balls" or "defensive ball launchers", known as LBDs, that shoot 40 millimetres (1.6 in) rubber projectiles, which have been blamed for a number of serious injuries. French Interior Minister Christophe Castaner admitted in media interviews that the weapon could cause injuries and had been used more than 9,000 times since yellow vests demonstrations began. The day before the Act XII protests, the government warned the public that police would not hesitate to use the weapons to combat violence by demonstrators, since they had been authorized by the court. On Saturday, thousands in Paris participated in a "march of the injured" calling for the weapon to be banned. Injured protesters marched at the front, some wearing eye patches with a target sign on them. Jerome Rodrigues, a well-known participant in the movement who lost an eye in the previous week's demonstrations, was received warmly with applause by the crowds. Most of the demonstrations during Act XII were peaceful. As in prior weeks, 80,000 security officials had been mobilized, including 5,000 in Paris. In Paris, police used tear gas and water cannons at Place de la Republique in the city centre to force demonstrators back after clashes with protesters, some hooded or masked, and some who set fire to bins and a scooter. Despite these incidents, the media reported that demonstrations "remained relatively calm compared to previous weekends." Two police officers were injured and two protesters arrested in Morlaix; two officers injured and one demonstrator arrested in Nantes; and in Lille, where between 1,800 and 3,000 protesters marched, 20 were arrested. The twelfth week of protests occurred as the French parliament was considering a new law proposed by Macron's governing party restricting the right to protest. The proposed law would outlaw covering one's face during a street demonstration (whether with a helmet, mask, or scarf), punishable by a €15,000 fine or imprisonment, and allow local police to establish blacklists of people not allowed to participate in street protests. The proposed law was opposed by some members of parliament inside and outside Macron's party. 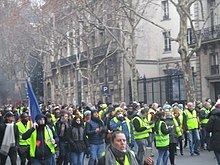 About 41,500 protesters (5,000 in Paris) took to the streets again on Saturday 16 February, for the 14th consecutive weekend. In Paris, a group of individuals involved in the march confronted the high-profile Jewish philosopher and academician Alain Finkielkraut with anti-Semitic verbal abuse. Police stepped in to protect him, and Macron later said that this behaviour was an "absolute negation" of what made France great and would not be tolerated. The man leading the insults against the philosopher on published video-recordings of the event was detained for questioning on Tuesday on charges of hate speech. Police indicated he was close to the Salafi movement in 2014. 16 March: Act XVIII - "The Ultimatum"
Leaders of the movement stated on 8 March 2019 that a protest (which had already been dubbed "The Ultimatum") was currently being planned for the following weekend of 16 March. As of 22 December, 10 fatalities had been linked to the protests in France. On 29 November, François Ruffin, the founder of hard-left Fakir magazine, organised a mobilising meeting with various French left-wing movements, at which Frédéric Lordon spoke of the Yellow Vests, saying "If the Nuitdeboutistes who got all wound up into deforestation and anti-specist commissions can't get moving when this happens, then they are the last of the last". Overall, by mid-December, trade losses of €2 billion had been reported as a result of the blocked roundabouts leading to commercial zones and the closures of urban chains. The chain supermarkets, in particular, reported that traffic has been down significantly, estimating the overall loss at around €600 million as of 13 December. Vinci SA, which operates roughly half of France's highway concessions, attributed the protests to the negation of its motorway sector growth, stating in its annual report to investors that traffic had dropped nine percent in the final three months of 2018 as a result of the protests. CEO Xavier Huillard said the fourth quarter loss "wiped out the increase in traffic of the first 10 months". Finkielkraut, interviewed by BFM-TV, was especially concerned with the viral nature of what he called a new type of "anti-racist" anti-Semitism (which he says consists of comparing Israeli colonization of Palestine with Nazism). He named Dieudonné and Alain Soral as those responsible for propagating this new form of anti-Semitism. Canada: Beginning in late December, various yellow-vest wearing protest movements have been seen across the country. However, protests have remained relatively smaller, and non-violent. Groups of various protesters wearing yellow vests have taken place in at least a dozen cities and towns across Canada as of January 2019. The movement in Canada is largely focused against the carbon price, the endorsement of the United Nations Global Compact for Safe, Orderly and Regular Migration (GCM), the federal Liberal government, and a wide range of topics. The protesters have largely consisted of right-wing supporters, some of whom have been criticized for allegedly holding far-right and xenophobic views due to their protests against Illegal Immigration. Although there have been counter-yellow-vest protests in parts of Canada, there have been no reports of police clashes or vandalism as of 20 January 2019. Egypt: A lawyer was detained for 15 days after posting a picture of himself wearing a high-visibility jacket in support of the protests in France. 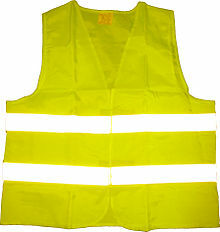 Sales restrictions on yellow reflective vests were introduced in an attempt to prevent opposition groups. Ireland: On 22 December, Hundreds attended a yellow vests protest in the centre of Dublin against 'the perceived failures of the Government'. Pakistan: Hundreds of engineers staged a day long protested at Lahore wearing yellow vests. Portugal: On 21 December 2018, a coletes amarelos (yellow vest) rally was held under the slogan Vamos Parar Portugal ("Let's Bring Portugal to a Halt"). ↑ "Yellow Vest movement has launched in Australia". Courier Mail. 2 January 2019. 1 2 3 Jean-Pierre Stroobants. "En Belgique, un mouvement de " gilets jaunes " se cherche un débouché politique". Le Monde.fr (in French). Archived from the original on 27 November 2018. Retrieved 27 November 2018. 1 2 "Gilets jaunes : la Belgique et la Bulgarie ont elles aussi leurs Gilets jaunes". LCI (in French). 20 November 2018. Archived from the original on 28 November 2018. Retrieved 2 December 2018. 1 2 Rémi Carlier (26 December 2018). "Liban, Tunisie, Burkina Faso… les Gilets jaunes font des émules à travers le monde". France 24 (in French). Archived from the original on 27 December 2018. Retrieved 28 December 2018. ↑ Sarah Rieger (8 December 2018). "Alberta yellow vest protests lack violence seen in Paris, but anti-immigration anger simmers". CBC. Archived from the original on 14 December 2018. Retrieved 15 December 2018. 1 2 "Hrvatski Žuti prsluci: 'Nije isključeno da dođemo na adrese članova vlade'". Index.hr. 15 December 2018. Archived from the original on 24 December 2018. Retrieved 24 December 2018. 1 2 "Maanantaina tämä on totta Suomessa! Suomalaiset keltaliivit osoittavat mieltä eduskuntatalon edessä - "meuhkataan" hävisi facebookin äänestyksen". Talouselämä (in Finnish). 13 December 2018. Archived from the original on 2 January 2019. Retrieved 1 January 2019. ↑ "L'Allemagne se connecte au phénomène des "gilets jaunes"". RFI (in French). 28 November 2018. Archived from the original on 29 November 2018. Retrieved 2 December 2018. 1 2 Linda Givetash (5 December 2018). "France's 'Yellow Jackets' inspire protesters in Iraq". NBC News. Archived from the original on 6 December 2018. Retrieved 5 December 2018. ↑ "Dozens gather in Dublin for 'yellow vests' protest". Irish Times. 15 December 2018. Archived from the original on 15 December 2018. Retrieved 16 December 2018. 1 2 Hagay Hacohen (13 December 2018). "Yellow Vest protest reach Israel, rage against high living cost mounts". The Jerusalem Post. Archived from the original on 14 December 2018. Retrieved 13 December 2018. 1 2 "In Pictures: Protesters march against Italy's tough new anti-migrant law". AFP via El Arabiya. 16 December 2018. Archived from the original on 8 January 2019. Retrieved 7 January 2019. Several thousand people marched in Rome Saturday in protest at Italy's tough new anti-migrant law, which makes it easier to expel new arrivals. The protesters waved flags and donned yellow vests emblazoned with the slogan 'Get up! Stand Up! for your right' in a reference to the famous Bob Marley song. The new law would 'only increase the number of people without papers in Italy and force people underground', protester Kone Brahima, originally from Ivory Coast, told AFP. ↑ Taylor Luck (13 December 2018). "Jordanian protesters don yellow vests as demonstrations spread". The National. Archived from the original on 15 December 2018. Retrieved 15 December 2018. ↑ Sarah El Deeb (23 December 2018). "Lebanese, some in yellow vests, protest political gridlock". ABC News. Archived from the original on 2018-12-25. Retrieved 2019-01-08. 1 2 Janene Pieters (10 December 2018). "Limited turnout for 'yellow vests' protests in Netherlands; only three arrests". NLtimes.nl. Archived from the original on 11 December 2018. Retrieved 22 December 2018. 1 2 "Govt-employed engineers block The Mall". Pakistan Today. 19 December 2018. Archived from the original on 22 December 2018. Retrieved 22 December 2018. 1 2 "Portugal's 'yellow vests' turn out for anti-government protest". Euronews. 21 December 2018. Archived from the original on 24 December 2018. Retrieved 24 December 2018. 1 2 Chernykh, Alexander; Buranov, Ivan (23 December 2018). "«Желтые жилеты» дошли до Сокольников" ['Yellow Vests' reach Sokolniki"]. Kommersant (in Russian). Archived from the original on 25 December 2018. Retrieved 25 December 2018. ↑ "French 'yellow vests' spark copycat protests worldwide". Daily Sabah. 17 December 2018. Archived from the original on 15 January 2019. Retrieved 15 January 2019. ↑ Cheung, Eric. "'Yellow vest' protest movement spreads to Taiwan". CNN. Archived from the original on 21 December 2018. Retrieved 22 December 2018. ↑ "'Yellow vests' reach Turkey as thousands protest cost of living". Al-Arabiya. 17 December 2018. Archived from the original on 10 January 2019. Retrieved 10 January 2019. ↑ "Are the Yellow Vests Spreading beyond France?". BBC. 14 December 2018. Archived from the original on 14 December 2018. Retrieved 15 December 2018. 1 2 Alexis Spire (December 2018). "Aux sources de la colère contre l'impôt". Le Monde Diplomatique (in French). Archived from the original on 1 December 2018. Retrieved 1 December 2018. ↑ Alexandre Lemarié (4 December 2018). "Les 'gilets jaunes' ciblent la suppression de l'ISF, 'péché originel' de Macron". Le Monde (in French). Archived from the original on 5 December 2018. Retrieved 5 December 2018. 1 2 "Furious French drivers to block roads in fuel price protest, but are they right to?". The Local. 30 October 2018. Archived from the original on 2 December 2018. Retrieved 2 December 2018. 1 2 Jean-Gabriel Bontinck; les éditions départementales (3 December 2018). "Les radars, cibles privilégiées des Gilets jaunes". Le Parisien (in French). Archived from the original on 4 December 2018. Retrieved 5 December 2018. ↑ Rémi Bourgeot (26 November 2018). "La mondialisation a enfanté des gilets jaunes". Atlantico (in French). Archived from the original on 4 December 2018. Retrieved 4 December 2018. ↑ "In their own words: France's yellow vests explain their grievances and goals". The Local. 10 December 2018. Retrieved 25 February 2019. ↑ Durand, Cédric (14 December 2018). "A Movement With a Future". Jacobin. Retrieved 18 February 2019. The second path is that of the Left and the social movements, a direction clearly developed in the critique of neoliberalism since the 1990s. Among the gilets jaunes, demands for social justice, wage increases, defense of public services, and hostility to the oligarchy have been fueled by several decades of criticism of globalized and financialized capitalism. The centrality of demands for the restoration of the wealth tax, and the circulation of videos of François Ruffin or Olivier Besancenot, testify to the strength of this left wing of the movement. ↑ "The Yellow Vests: Who they are and why their tax protest is a big deal". The Mercury News. Associated Press. 20 November 2018. Archived from the original on 21 November 2018. Retrieved 21 November 2018. 1 2 3 4 5 Gilets Jaunes (29 November 2018). "Les revendication des gilets jaunes" (in French). France Bleu. Archived from the original on 12 December 2018. Retrieved 12 December 2018. 1 2 Gregory Viscusi; Helene Fouquet (4 December 2018). "Macron Blinks as Yellow-Vests Protest Forces Fuel-Tax Climbdown". Bloomberg. Archived from the original on 4 December 2018. Retrieved 7 December 2018. 1 2 "France 24, "'Yellow Vests' open a new front in the battle: Popular referendums", 17/12/2018". Archived from the original on 2 January 2019. Retrieved 15 January 2019. ↑ Nossiter, Adam (2 December 2018). "'Yellow Vests' Riot in Paris, but Their Anger Is Rooted Deep in France". The New York Times. Archived from the original on 3 December 2018. Retrieved 3 December 2018. ↑ "Hundreds arrested as police clash with 'Yellow Vest' protesters in Paris". France24. AP, Reuters. 2 December 2018. Archived from the original on 3 December 2018. Retrieved 3 December 2018. ↑ "Anarchists, butchers and finance workers: A look at the Paris rioters". The Local. December 5, 2018. Retrieved March 10, 2019. ↑ Rodriguez, Cecilia (2 December 2018). "Riots In Paris: 'Yellow Vests' Violence, Vandalism And Chaos Hitting Tourism". Forbes. Archived from the original on 3 December 2018. Retrieved 3 December 2018. ↑ "Almost 100 injured during French fuel protests". Irish Times. 2 December 2018. Archived from the original on 4 December 2018. Retrieved 3 December 2018. ↑ "Yellow vest protesters clash with police in Paris, in pictures". The Telegraph. 1 December 2018. Archived from the original on 3 December 2018. Retrieved 4 December 2018. ↑ "The violence, burning and looting wasn't just in Paris on Saturday". The Local. 3 December 2018. Archived from the original on 3 December 2018. Retrieved 4 December 2018. ↑ Willsher, Kim (4 December 2018). "Gilets Jaunes protests in France to continue despite fuel tax U-turn". The Guardian. Archived from the original on 4 December 2018. Retrieved 5 December 2018. 1 2 "France yellow vest protests: Macron promises wage rise". BBC. 10 December 2018. Archived from the original on 10 December 2018. Retrieved 10 December 2018. 1 2 Durand, Anne-Aël (5 December 2018). "Pourquoi il est compliqué de geler les tarifs réglementés de l'électricité". Le Monde. Archived from the original on 9 December 2018. Retrieved 10 December 2018. ↑ "Macron Promises Minimum Wage Hike And Tax Cuts To End 'Yellow Vest' Protests". NPR. Archived from the original on 11 December 2018. Retrieved 11 December 2018. ↑ "Gilets jaunes – Le ministre de l'Intérieur indique que le pics de manifestants s'est élevé à 282710 manifestants, atteint vers 17 heures". France Info (in French). Retrieved 20 November 2018. 1 2 3 Staff, Our Foreign (22 December 2018). "Driver killed in accident at Yellow Vest roadblock in southern France". The Telegraph. Archived from the original on 22 December 2018. Retrieved 22 December 2018. 1 2 "«Gilets jaunes»: trois Belges décédés depuis le début du mouvement". sudinfo.be (in French). Sudinfo. Belga. 12 January 2019. Archived from the original on 13 January 2019. Retrieved 12 January 2019. 1 2 "Gilets jaunes: 2891 blessés depuis le début du mouvement". Archived from the original on 21 December 2018. Retrieved 23 December 2018. ↑ "Gilets jaunes: quel est le bilan officiel des morts, blessés, et interpellés depuis le début du mouvement?". Libération. 4 December 2018. Archived from the original on 9 December 2018. Retrieved 8 December 2018. ↑ Saskya Vandoorne; Hilary Clarke (9 December 2018). "France's 'yellow vest' protesters detained and tear-gassed". CNN. Archived from the original on 9 December 2018. Retrieved 9 December 2018. Fareed Zakaria (13 December 2018). "The new dividing line in Western politics". The Washington Post. Archived from the original on 17 December 2018. Retrieved 17 December 2018. Nossiter, Adam (24 November 2018). "Tear Gas and Water Cannons in Paris as Grass-Roots Protest Takes Aim at Macron". The New York Times. ISSN 0362-4331. Archived from the original on 29 December 2018. Retrieved 28 December 2018. Petrequin, Samuel (16 December 2018). "Yellow vest protesters still block French traffic circles". AP News. Archived from the original on 29 December 2018. Retrieved 28 December 2018. Yellow vest protesters occupied dozens of traffic roundabouts across France on Sunday even as their movement for economic justice appeared to be losing momentum on the fifth straight weekend of protests. 1 2 3 "Priscillia Ludosky, une Martiniquaise derrière les gilets jaunes". France-Antilles (in French). 20 November 2017. Archived from the original on 10 January 2019. Retrieved 13 January 2019. Ce mardi soir, cette dernière comptabilisait plus de 938 325 signataires sur internet. ↑ Aline Leclerc. "Gilets jaunes: anatomie d'une journée de colère". Le Monde. Archived from the original on 19 November 2018. Retrieved 19 November 2018. ↑ Willsher, Kim (16 November 2018). "'Gilets jaunes' protesters threaten to bring France to a standstill". the Guardian. Archived from the original on 18 November 2018. Retrieved 19 November 2018. ↑ Smith, Saphora (27 November 2018). "The Champs-Élysées in Paris became a blazing battleground. Here's why". NBC News. Archived from the original on 1 December 2018. Retrieved 2 December 2018. ↑ Aurélie Dianara (30 November 2018). "We're With the Rebels". The Jacobin. Archived from the original on 2 December 2018. Retrieved 2 December 2018. 1 2 3 4 5 6 7 Michel Rose; Luke Baker (6 December 2018). "No leader, lots of anger: can France's 'yellow vests' become a political force?"". Reuters. Archived from the original on 18 December 2018. Retrieved 17 December 2018. 1 2 3 4 5 Friedman, Vanessa (4 December 2018). "The Power of the Yellow Vest". The New York Times. ISSN 0362-4331. Archived from the original on 3 January 2019. Retrieved 2 January 2019. 1 2 3 "Who Are France's Yellow Vest Protesters, And What Do They Want?". NPR.org. Archived from the original on 30 December 2018. Retrieved 2 January 2019. 1 2 Emmanuel Fansten; Willy Le Devin; Ismaël Halissat (2 December 2018). "Paris:émeutes inédites depuis 68". Libération (in French). Archived from the original on 3 December 2018. Retrieved 11 December 2018. 1 2 Domoney, Ross. "'My hand was hanging from my wrist': gilets jaunes protesters mutilated by police weapons". The Guardian. Retrieved 8 March 2019. ↑ Henley, Jon (21 December 2018). "How hi-vis yellow vest became symbol of protest beyond France". The Guardian. ISSN 0261-3077. Archived from the original on 28 December 2018. Retrieved 19 January 2019. ↑ Weill, Kelly (8 January 2019). "The Far Right Is Trying to Co-opt the Yellow Vests". The Daily Beast. Archived from the original on 12 January 2019. Retrieved 19 January 2019. ↑ Mark Lynas (31 December 2018). "Why President Macron's U-turn is a warning for climate leaders". CNN. Archived from the original on 3 January 2019. Retrieved 3 January 2019. The immediate cause of the protests? The carbon taxes on petrol and diesel that Macron had only recently touted as evidence of French leadership on mitigating climate change. ↑ "Macron's popularity falls to 25 percent: poll". Yahoo News. 17 November 2018. Archived from the original on 19 January 2019. Retrieved 17 January 2019. ↑ Arthur Berdah (26 April 2018). "Pour Hollande, Macron est «le président des très riches»" (in French). Archived from the original on 31 October 2018. Retrieved 20 January 2019. ↑ Service Politique (21 June 2017). "Démission de François Bayrou : « Il devenait le sparadrap du capitaine Haddock »" (in French). Archived from the original on 21 January 2019. Retrieved 20 January 2019. ↑ "France: de nouvelles révélations compliquent la situation de François Bayrou". RFI (in French). 14 June 2017. Retrieved 20 January 2019. ↑ "La démission de Nicolas Hulot : « Je ne veux plus me mentir »". Le Monde / AFP (in French). 28 August 2018. Archived from the original on 10 January 2019. Retrieved 20 January 2019. ↑ L'Obs (2 October 2018). "Démission de Collomb : "Cirque", "grand-guignol", "mauvais vaudeville" et "débandade"". l'Obs (in French). Archived from the original on 21 January 2019. Retrieved 20 January 2019. ↑ Serge Rafy (2 October 2018). "Collomb et Macron, un divorce au forceps". l'Obs (in French). Archived from the original on 21 January 2019. Retrieved 20 January 2019. ↑ "Diesel: les raisons d'une " exception culturelle " française". Les Echos (in French). 10 April 2014. Retrieved 1 December 2018. ↑ "Prix des carburants : l'essence à son plus bas de 2018, le diesel poursuit aussi sa baisse". LCI. Archived from the original on 5 December 2018. Retrieved 5 December 2018. 1 2 "Prix à la pompe: la part du brut, la part des taxes". Le Point (in French). AFP. 16 November 2018. Archived from the original on 23 November 2018. Retrieved 4 December 2018. 1 2 3 "'Shame' on Paris protesters, says Macron". BBC News. 25 November 2018. Archived from the original on 27 November 2018. Retrieved 27 November 2018. ↑ "Macron stands by fuel taxes". Energy Reporters. 28 November 2018. Archived from the original on 4 December 2018. Retrieved 4 December 2018. 1 2 "Lettre ouverte au Premier Ministre Edouard PHILIPPE". OTRE (in French). 20 November 2018. Archived from the original on 2 December 2018. Retrieved 2 December 2018. 1 2 "Emmanuel Macron promet des aides pour le chauffage et le carburant". Le Figaro (in French). 6 November 2018. Archived from the original on 3 December 2018. Retrieved 2 December 2018. 1 2 Eva Tapiero; Matthew Robinson; Laura Smith-Spark. "French fuel protests leave 1 dead, dozens injured". CNN. Archived from the original on 21 November 2018. Retrieved 20 November 2018. ↑ "Europe changes gear over speed limits on country roads". BBC News. 29 January 2019. Archived from the original on 30 January 2019. Retrieved 30 January 2019. ↑ "France to cut speed limit on roads to 80km/h in July despite opposition". The Local:fr. 7 March 2018. Archived from the original on 30 January 2019. Retrieved 30 January 2019. ↑ Nicolas. "Plus de 6000 radars vandalisés en 2018!". radars-auto.com (in French). Archived from the original on 31 January 2019. Retrieved 30 January 2019. Entre janvier et août 2018, 3 932 actes de vandalisme ont été enregistrés sur les radars automatiques. ↑ Lough, Richard; Carraud, Simon (4 December 2018). "France's Macron hunts for way out of 'yellow vest' crisis". Reuters. Archived from the original on 3 December 2018. Retrieved 4 December 2018. ↑ Viscusi, Gregory (3 December 2018). "Macron Fights on Two Fronts as French, German Risks Collide". Bloomberg News. Archived from the original on 4 December 2018. Retrieved 4 December 2018. ↑ Adam Nossiter (2 December 2018). "'Yellow Vests' Riot in Paris, but Their Anger Is Rooted Deep in France". New York Times. Archived from the original on 3 December 2018. Retrieved 7 December 2018. ↑ Atkin, Emily (10 December 2018). "France's Yellow Vest Protesters Want to Fight Climate Change". The New Republic. Archived from the original on 11 December 2018. Retrieved 11 December 2018. ↑ Rubin, Alissa J.; Sengupta, Somini (6 December 2018). "'Yellow Vest' Protests Shake France. Here's the Lesson for Climate Change". The New York Times. Archived from the original on 11 December 2018. Retrieved 11 December 2018. There is little doubt among scientists and economists — many of whom are in Poland for the current round of climate negotiations — that putting a price on carbon is essential in the effort to reduce fossil fuel dependence. . . . [However many] analysts say the French tax was not politically deft, falling hardest on people outside French cities who were already feeling the pain of stagnating incomes and who do not have the same mass transportation options as urban residents. ↑ Lichfield, John (9 February 2019). "Just who are the gilets jaunes?". The Guardian. ISSN 0261-3077. Retrieved 9 February 2019. ↑ "Priscillia Ludosky, la force tranquille des "gilets jaunes"". L'Obs (in French). 15 January 2019. Retrieved 9 February 2019. 1 2 Leonardo Bianchi (20 November 2018). "Chi sono i 'gilet gialli', la versione francese dei Forcone". Vice (in Italian). Archived from the original on 2 December 2018. Retrieved 1 December 2018. 1 2 3 John Lichfield (3 December 2018). "Never before have I seen blind anger like this on the streets of Paris". The Guardian. Archived from the original on 7 December 2018. Retrieved 8 December 2018. ↑ Henry Mance (6 December 2018). "Barricades in Paris make Brexit bankers think again". Financial Times. Archived from the original on 7 December 2018. Retrieved 8 December 2018. (Registration required (help)). 1 2 Walt, Vivienne (30 November 2018). "'There Is an Atmosphere of Civil War.' France's Yellow Jackets Are Driving Fury at Macron". Time. Archived from the original on 30 November 2018. Retrieved 1 December 2018. ↑ "France's Macron hunts for way out of 'yellow vest' crisis". Reuters. 3 December 2018. Archived from the original on 20 December 2018. Retrieved 20 December 2018. ↑ Mathilde Damgé; Anne-Aël Durand; Maxime Vaudano; Jérémie Baruch; Pierre Breteau (4 December 2018). "Sur un axe de Mélenchon à Le Pen, où se situent les revendications des 'gilets jaunes'?". Le Monde (in French). Archived from the original on 11 December 2018. Retrieved 12 December 2018. ↑ Étienne Girard (10 December 2018). "Ni Macron, ni Mélenchon, ni Le Pen : les gilets jaunes votent… Coluche". Marianne (in French). Archived from the original on 11 December 2018. Retrieved 12 December 2018. 1 2 Frédéric Lordon (5 December 2018). "Fin de monde?". La pompe à phynance (in French). Le Monde Diplomatique. Archived from the original on 15 December 2018. Retrieved 13 December 2018. Depuis les grèves de 1995, la conscience de ce que les médias censément contre-pouvoirs sont des auxiliaires des pouvoirs, n’a cessé d’aller croissant. 1 2 Enguérand Renault (7 December 2018). ""Gilets jaunes" : les rédactions prennent des mesures pour assurer la sécurité des journalistes". Le Figaro (in French). Archived from the original on 12 December 2018. Retrieved 13 December 2018. Chaque journaliste sur le terrain est accompagné d'un agent de sécurité, souligne Hervé Béroud, le directeur général de la chaîne. Cet agent est à même d'évaluer la dangerosité de la situation et d'intervenir en cas d'agression du journaliste. ↑ François Chrétien (27 December 2018). "Loire-Atlantique. Ce journal que des Gilets jaunes ont empêché de paraître" (in French). Retrieved 7 January 2019. ↑ Alexander Hurst (7 January 2019). "The Ugly, Illiberal, Anti-Semitic Heart of the Yellow Vest Movement". New Republic. Archived from the original on 8 January 2019. Retrieved 7 January 2019. ↑ Margaux Baralon (19 November 2018). "Comment les "gilets jaunes" ont bouleversé les codes de la contestation". Europe1 (in French). Archived from the original on 10 December 2018. Retrieved 10 December 2018. ↑ Blandine Le Cain (30 November 2018). "Les 'gilets jaunes', un mouvement sans leader dans lequel les 'fake news' prospèrent". Le Figaro (in French). Archived from the original on 10 December 2018. Retrieved 9 December 2018. ↑ Marie-Hélène Miauton (6 December 2018). "Des «gilets jaunes» helvétiques: impossible!". Le Temps (in French). Archived from the original on 23 December 2018. Retrieved 22 December 2018. ↑ "Le système politique suisse ausculté par la France et les "gilets jaunes"". Radio Télévision Suisse (in French). 18 December 2018. Archived from the original on 23 December 2018. Retrieved 22 December 2018. ↑ Vincent Glad (2 January 2019). "Gilets jaunes Histoire du RIC, un cri du peuple". Liberation (in French). Archived from the original on 6 January 2019. Retrieved 6 January 2019. ↑ Romain Bruny (18 March 2017). "La VIe République : une idée qui fait son chemin". France 24 (in French). Archived from the original on 3 January 2019. Retrieved 6 January 2019. ↑ Jacob Hamburger (3 January 2019). "France's Yellow Vests: A Test for the Populist Left". Dissent. Archived from the original on 6 January 2019. Retrieved 6 January 2019. ↑ "VIDEO. Qu'est-ce que le RIC, la revendication-phare des gilets jaunes ?". 18 December 2018. Archived from the original on 19 December 2018. Retrieved 6 January 2019. ↑ Ben McPartland (20 November 2018). "LATEST: French police dislodge fuel protesters as movement wanes (for now)". The Local. Archived from the original on 20 November 2018. Retrieved 20 November 2018. 1 2 John Lichfield (2 December 2018). "ANALYSIS: The savage violence in Paris was not a protest, it was an insurrection". The Local. Archived from the original on 3 December 2018. Retrieved 2 December 2018. ↑ "France's 'yellow vest' protesters block access to fuel depots". France 24. 19 November 2018. Archived from the original on 21 November 2018. Retrieved 21 November 2018. ↑ Serge Pueyo (17 November 2018). "Gilets jaunes: qui était Chantal, morte écrasée sur un barrage" (in French). Archived from the original on 20 November 2018. Retrieved 2 December 2018. 1 2 3 4 5 "" Gilets jaunes " : un troisième mort en marge du mouvement". Le Monde (in French). 2 December 2018. Archived from the original on 3 December 2018. Retrieved 4 December 2018. ↑ "" Gilets jaunes " : barrages, casse et " sévérité " promise par l'Etat : le point sur la journée de mercredi" (in French). Le Monde. 21 November 2018. Archived from the original on 29 November 2018. Retrieved 3 December 2018. 1 2 "French troops deployed amid protests on Reunion island". ABC News. Associated Press. Archived from the original on 22 November 2018. Retrieved 22 November 2018. 1 2 3 Willsher, Kim (24 November 2018). "French 'gilets jaunes' protests turn violent on the streets of Paris". The Guardian. Archived from the original on 26 November 2018. Retrieved 27 November 2018. ↑ Willsher, Kim (26 November 2018). "Macron: Paris protest 'battle scenes' could hurt France's image". the Guardian. Archived from the original on 27 November 2018. Retrieved 27 November 2018. ↑ "Gilets Jaunes: Protesters warn of ports disruption". Connexionfrance.com. Archived from the original on 2 December 2018. Retrieved 2 December 2018. ↑ Z.L. (1 December 2018). "Incidents à Strasbourg, préfecture assiégée au Puy-en-Velay: 75 000 Gilets jaunes en France". Le Parisien (in French). Archived from the original on 15 December 2018. Retrieved 11 December 2018. ↑ Flora Chaduc (2 December 2018). "Gilets jaunes à Lyon : mobilisation sur le TEO, l'A6 fermée vers Lyon". Lyon Capitale (in French). Archived from the original on 3 December 2018. Retrieved 4 December 2018. ↑ Aurélie Dianara (2 December 2018). "One dead as France considers state of emergency over protests". Channel NewsAsia. Archived from the original on 3 December 2018. Retrieved 4 December 2018. ↑ "" Sang sur les mains ". À Marseille, des milliers de manifestants en colère réclament la démission du maire". OuestFrance (in French). 15 November 2018. Archived from the original on 16 November 2018. Retrieved 5 December 2018. 1 2 3 "France fuel protests: 80-year-old woman killed in her home". BBC. 3 December 2018. Archived from the original on 3 December 2018. Retrieved 3 December 2018. 1 2 "Marseille. L'IGPN saisie après la mort d'une octogénaire blessée par une grenade". Ouest France (in French). 3 December 2018. Archived from the original on 4 December 2018. Retrieved 4 December 2018. ↑ Sofiane Aissaoui (9 December 2018). "Gilets jaunes : flambée des violences à Lyon, au Puy-en-Velay et à Saint-Etienne". France3 Regions (in French). Archived from the original on 9 December 2018. Retrieved 9 December 2016. ↑ F.L. (8 December 2018). "Gilets jaunes: l'autoroute A6 fermée à hauteur de Villefranche-sur-Saône". France3 (in French). Archived from the original on 10 December 2018. Retrieved 10 December 2018. ↑ Claire Mayer (9 December 2018). "'Gilets jaunes' à Bordeaux : 'Tout a basculé en une heure'". Le Monde (in French). Archived from the original on 9 December 2018. Retrieved 13 January 2018. En fin de soirée, les rues de Bordeaux se sont embrasées. Parmi les fauteurs de troubles, plus de « gilets jaunes », mais des casseurs venus profiter de la tension. ... Dans son quartier populaire et familial, d’impressionnants feux étaient allumés, deux agences bancaires saccagées et un camion incendié. ... l'Apple Store de la rue Sainte-Catherine était pillé par une centaine de casseurs. 1 2 "France's 'yellow vests' clash with police in Paris". Reuters. 9 December 2018. Archived from the original on 8 December 2018. Retrieved 9 December 2018. ↑ Emmanuel Macron (10 December 2018). "Verbatim: Le discours d'Emmanuel Macron face aux "gilets jaunes"". Le Monde (in French). Archived from the original on 11 December 2018. Retrieved 10 December 2018. ↑ Pierre Dezeraud (11 December 2018). "Audiences: 23 millions de personnes devant l'intervention d'Emmanuel Macron". PureMedia (in French). Archived from the original on 11 December 2018. Retrieved 11 December 2018. ↑ Damien Durand (11 December 2018). "Macron: 100€ de plus pour le Smic? Pourquoi c'est faux". France Soir (in French). Archived from the original on 11 December 2018. Retrieved 12 December 2018. ↑ "Gel des tarifs bancaires et plafonnement des frais d'incidents : ce qu'a demandé Emmanuel Macron aux banquiers". LCI (in French). 11 December 2018. Archived from the original on 16 December 2018. Retrieved 12 December 2018. ↑ Kim Willsher (15 December 2018). "Gilets jaunes protesters take to the streets of Paris for fifth weekend". The Guardian. Archived from the original on 18 December 2018. Retrieved 16 December 2018. 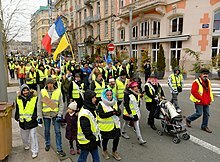 ↑ "" Gilets jaunes " : mobilisation en forte baisse avec environ 66 000 manifestants en France". Le Monde (in French). 15 December 2018. Archived from the original on 18 December 2018. Retrieved 16 December 2018. ↑ "France's 'yellow vests' block borders ahead of Christmas". AFP.com. Archived from the original on 22 December 2018. Retrieved 22 December 2018. 1 2 "« Gilets jaunes » : un mort et une mobilisation en demi-teinte pour l'« acte VI »" (in French). Le Monde. 22 December 2018. Archived from the original on 23 December 2018. Retrieved 23 December 2018. ↑ Kabir Chibber (21 December 2018). "Versailles, which survived the French revolution, is closing for the latest protests". Quartz. Archived from the original on 22 December 2018. Retrieved 22 December 2018. ↑ "Le "gilet jaune" Éric Drouet, interpellé samedi, sera jugé ultérieurement" (in French). L'Obs. 23 December 2018. Archived from the original on 23 December 2018. Retrieved 23 December 2018. 1 2 ML; LT (22 December 2018). "Haut-Doubs: des gilets jaunes ralentissent la circulation à la frontière suisse". France 3 (in French). Archived from the original on 22 December 2018. Retrieved 22 December 2018. ↑ "Gilets jaunes : Amazon bloqué, situation toujours tendue à Montélimar". Le Dauphiné (in French). 22 December 2018. Archived from the original on 22 December 2018. Retrieved 22 December 2018. ↑ "Gilets jaunes: des blocages aux frontières avec l'Espagne, l'Italie et l'Allemagne". Le Parisien (in French). 22 December 2018. Retrieved 22 December 2018. ↑ "EN DIRECT - Gilets jaunes : Castaner dénonce les manifestants "animés par la haine des institutions"". LCI (in French). Retrieved 2018-12-22. ↑ Jérôme Mornière (30 December 2018). "Acte VII des Gilets jaunes : de la violence et des scènes surréalistes à Rouen". 76actu (in French). actu.fr. Archived from the original on 6 January 2019. Retrieved 6 January 2019. ↑ Vincent Glad (4 January 2019). "Gilets jaunes: Je te BFM, moi non plus". Liberation (in French). Archived from the original on 6 January 2019. Retrieved 6 January 2019. 1 2 3 "Police must end use of excessive force against protesters and high school children in France". Amnesty International. Archived from the original on 27 December 2018. Retrieved 7 January 2019. ↑ Adam Nossiter (5 January 2019). "Violence Surges as Yellow Vests Attack French Government Ministry". The New York Times. Archived from the original on 6 January 2019. Retrieved 5 January 2019. ↑ Thibaut Lehut; France Bleu; France Blue Pays d'Auvergne. "DOCUMENT - Les gilets jaunes publient une liste de revendications" (in French). Archived from the original on 14 January 2019. Retrieved 13 January 2019. les gilets jaunes ... ont publié une liste de revendications sur les [sic] internet, à l'initiative d'une manifestante de la Sarthe. ↑ Raphaël Tual (28 November 2018). "Les femmes Gilets jaunes en première ligne à Rouen : « Les petits contrats, c'est pour nous »". actu.fr (in French). Archived from the original on 28 November 2018. Retrieved 9 January 2018. ↑ Pierre Rimbert (4 January 2019). "The future of labour is female". Le Monde Diplo. Archived from the original on 25 January 2019. Retrieved 25 January 2019. women are most of the staff of many vital but invisible sectors in a neoliberal society. They care, educate, support, and clear up the mess. ↑ Pierre Rimbert (January 2019). "La puissance insoupçonné des travailleuses". Le Monde Diplomatique (in French). les secteurs majoritairement féminins de l'éducation, ds soins, du travail social ou du nettoyage forment la clé de voûte invisible des sociétés libérales en même temps que leur voiture-balai. ↑ Le Monde; AFP (6 January 2019). "Des centaines de femmes « gilets jaunes » manifestent dans plusieurs villes de France". Le Monde (in French). Archived from the original on 8 January 2019. Retrieved 9 January 2019. ↑ "Yellow vests knock out 60% of all speed cameras in France". BBC. 12 January 2019. Archived from the original on 11 January 2019. Retrieved 12 January 2019. ↑ ""Gilets jaunes" : la moitié des radars automatiques de France ont été mis hors service". Europe1 (in French). 10 December 2018. Archived from the original on 13 January 2019. Retrieved 12 January 2019. 1 2 Paul Carcenac (12 January 2019). "«Gilets jaunes»: forte mobilisation pour «l'acte IX», au moins 84.000 manifestants". Le Figaro (in French). Archived from the original on 13 January 2019. Retrieved 13 January 2019. "Montpellier ... Les casseurs [sic] ont répliqué à des caillassages par des tirs de bombes lacrymogènes. 1 2 3 4 5 6 7 8 De Clercq, Geert; Paone, Antony (12 January 2019). "Yellow vest protests hit with police water cannon, tear gas in Paris". Reuters. Archived from the original on 13 January 2019. Retrieved 13 January 2019. 1 2 3 4 5 "French 'yellow vests' rally in fresh round of protests". AFP via Al Jazeera. Archived from the original on 13 January 2019. Retrieved 13 January 2019. ↑ Mathilde Cousin (16 January 2019). "Acte 9 des «gilets jaunes»: Oui, des CRS avec des fusils d'assaut ont bien été déployés le 12 janvier". 20 minutes (in French). Retrieved 18 January 2019. ↑ Karl Laske (16 January 2019). "Gilets jaunes: les armes de l'escalade policière". Mediapart (in French). Archived from the original on 19 January 2019. Retrieved 18 January 2019. 1 2 "Paris gas leak explosion leaves 4 dead amid 'yellow vest' protests". AP via CNBC. 12 January 2019. Archived from the original on 13 January 2019. Retrieved 13 January 2019. ↑ Le Figaro; AFP (19 January 2019). "«Gilets jaunes» : il y avait 84.000 manifestants samedi, comme la semaine dernière". Le Figaro (in French). Archived from the original on 20 January 2019. Retrieved 20 January 2019. 1 2 Willsher, Kim (27 January 2019). "Gilets jaunes leader hit in eye during protest 'will be disabled for life'". The Guardian. ISSN 0261-3077. Archived from the original on 28 January 2019. Retrieved 28 January 2019.